The Women’s Business Development Center (WBDC) in Chicago, IL, is a nonprofit service organization and stalwart supporter of women’s business ownership since 1986. It is also a Regional Partner Organization of Women’s Business Enterprise National Council, which commissioned Ahlers Designs to create sculptural artworks in honor of WBDC co-founders and co-presidents Carol Dougal and Hedy Ratner. With the innovative leadership of Dougal and Ratner in mind, Gail Ahlers focused on the rich history of women’s entrepreneurship and Chicago while designing the sculpture. The cut steel portrayal of the WBDC’s headquarters, The Willoughby Tower, is framed in 100-year-old reclaimed lumber. 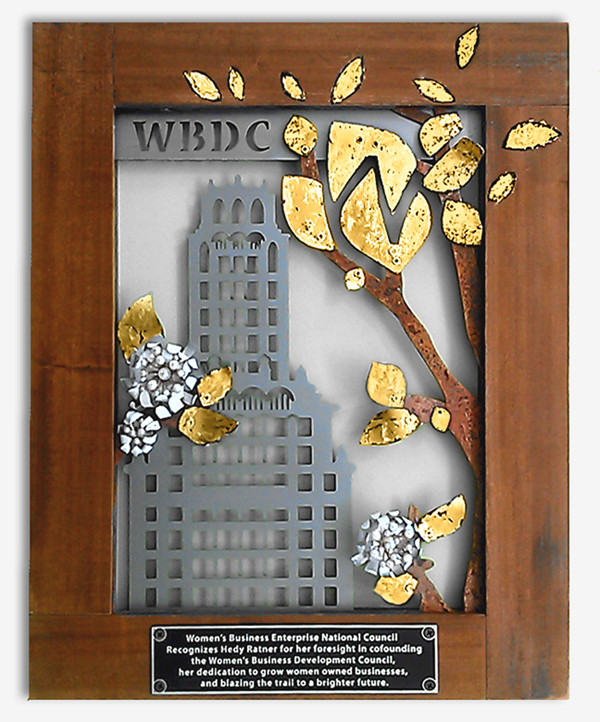 WBDC’s “W” logo is cleverly displayed in the forged steel tree leaves and layered in 23k Gold Leaf, making all the more visual WBDC’s motto: “Your growth is our business.” The sustainably designed chrysanthemum flowers (the official flower of Chicago) are made from recycled Pepsi cans. The flowers showcase pearl clusters—a favorite of Dougal and Ratner—and symbolize beauty derived from overcoming adversity.